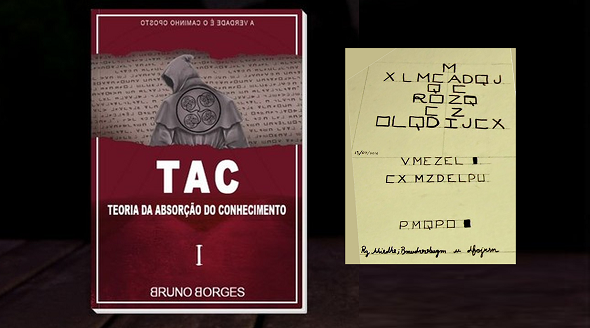 Bruno Borges, a Brazilian student who has mysteriously vanished from his home, left behind several encrypted books. A publishing company has now published one of them. It has entered the Brazilian bestseller list. A book I recently wrote about has entered the bestseller list. No, it’s not my own book Versteckte Botschaften (I hope this one will enter the bestseller lists, as soon as it is published next month) and it’s not Craig Bauer’s Unsolved!. Instead, it is a book written by Bruno Borges, a Brazilian student who has mysteriously vanished from his home. It’s certainly a surpise that Borges’ book sells so well. I doubt that its content is terribly interesting and it was probably never meant for publication. On the other hand, cryptograms related to potential crimes are an extremely popular topic – especially when both the crime and the cryptogram are unsolved. For this reason, my blog posts about the Zodiac killer, the Debosnys murder, the Ricky McCormick case and a few others all rank among the most-read in the history of Klausis Krypto Kolumne. Bruno Borges (the following picture is taken from Facebook), a 24 year old psychology student from Brazil, was known among his friends as an alien enthusiast. He was working on a mysterious project, asking several relatives for funding. In early April this year Borges vanished from his family home. A bizarre video of the inside of his bedroom was leaked online. Apparently, Borges had turned his room into a shrine to the extraterrestrial world. He removed all the furniture and put up a statue of Renaissance polymath Giordano Bruno (1548-1600). Bruno Borges admired Giordano Bruno not only because of the common name “Bruno”, but also because he was one of the first to believe in the possibility of extraterrestrial life. 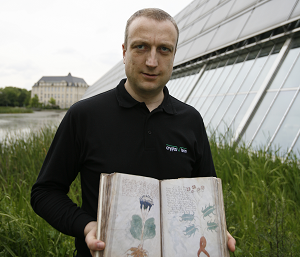 For readers of this blog it is note-worthy that Girodano Bruno is one of the many Renaissance scholars that have been believed to be the author of the famous Voynich Manuscript. What makes Borges’ vanishing interesting for this blog is the fact that he left behind 14 encrypted books (encrypted books have a long history, as can be seen on my encrypted book list) and that the walls in his room have been found covered with cipher writing. All this has been a farce by Borges, two friends of his and his cousin. The police found evidence of a rather clumsy farce at his friends’ house (an agreement or contract signed by Borges for the selling of his 14 encrypted books and finally they would share the money). He hasn’t appeared yet but his disappearance is a part of this farce too. Seems like the big Text is written in the same language as the VM. Marketingstrategie 1+. Think there are some “overlayed” encryptions in the VM. Each one leads to a different cleartext… Maybe there are fourteen. Maybe the Autor oft the VM settet the ground for research about programmed cell death and the inversion of it…. The nymphs clear the cells… Lol naked housekeepers..
Would Vladimir k laugh out lout ? Just for your information, Bruno Borges is back, healthy and in a good temper. The whole project was indeed a Viral Marketing for his book. Many fans belong to his fan base now, another are pretty disappointed that he has fooled them. Tudo o que fiz foi para despertar o melhor de cada um, isso foi um despertar para mim, para meus pais, meus irmãos, e outras pessoas. Quero agradecer a todos que estão aqui, me ouvindo. Para vocês, que sempre apoiaram todo este projeto e nunca perderam a esperança, defensores da arte, da inovação aliada ao conhecimento, da filosofia unida à ciência. Vocês que enxergam as boas ações e valorizam o trabalho criativo juntamente aos esforços do próximo. Que percebem que finalmente é hora de todos nós despertarmos. Para vocês eu só tenho uma coisa a dizer: vocês salvaram a minha vida! Alguns disseram que eu lhes fiz renascer. Não sei o que posso dizer, pois eu quem me sinto renascido. Sempre soube que seria muito atacado pois quem quer levar conhecimento e busca inovar sempre é incompreendido. Mas fico feliz em ver que tem pessoas que acreditam em minhas intenções e que tem fé. Se não fosse por elas eu não teria visto mais propósito nas causas que lutei com tanto sacrifício. Vocês mantêm a minha lamparina acesa e com isto posso vigiar minha casa. Compreendam os sinais desta época, é tempo de caminharmos rumo ao despertar da consciência. 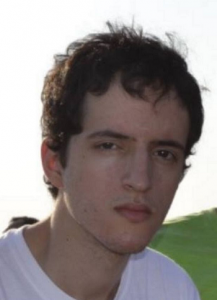 Eu continuarei buscando a verdade e quero convidar todos a buscarem comigo. Vamos aprender uns com os outros e busquemos reparar na nossa trave de madeira antes de querer tirar o cisco do irmão (Mateus 7:3). Eu tenho muitos sonhos e projetos pela frente e sempre vou trabalhar com a mesma determinação, darei o máximo de mim pois Deus não nos dá mais do que podemos carregar. Vocês são pessoas incríveis, independentemente do que pensam a meu respeito. Eu acho todos incríveis. Sei do potencial das pessoas, o ser-humano tem uma sabedoria infinita dentro de si, basta acreditarmos. O primeiro passo é acreditar em si mesmo, porque se você não acredita em si mesmo então provavelmente não acreditará nas ações do seu próximo. Portanto, parabéns a todos aqueles que acreditam e que buscam fazer da religião o seu espírito e da ciência a sua carne. Se buscarmos a verdade todo o resto nos será acrescentado. Tudo é possível àquele que crê (Marcos 9:23), portanto, não desistamos de nossos sonhos jamais. Obrigado de coração a todos que me trazem mensagens de carinho e me apoiam, vocês dão sentido a minha vida! All I did was to wake up the best of each, that was a waking call to me, to my parents, my brothers, and other people. I want to thank everyone who’s here, listening to me. For You, who have always supported this whole project and have never lost hope, defenders of art, innovation combined with knowledge, of the philosophy United to science. You who see good deeds and value creative work together with the efforts of the next. Who realize it’s finally time for all of us to we. For you I only have one thing to say: you saved my life! Some said I made them reborn. I don’t know what I can say, because I feel reborn. I always knew you’d be very attacked because anyone who wants to take knowledge and search for innovation is always misunderstood. But I’m glad to see that you have people who believe in my intentions and that you have faith. If it weren’t for them I wouldn’t have seen any more purpose in the causes I fought with so much sacrifice. You keep my lamp on, and with this i can watch my house. Understand the signs of this season, it is time to move towards the awakening of consciousness. I’ll keep looking for the truth, and I want to invite everyone to come with me. We will learn from each other and seek to repair our wooden beam before wanting to remove the cisco from the brother (Matthew 7:3). I have many dreams and projects ahead and I will always work with the same determination, I will give the most of me For God does not give us more than we can carry. You’re amazing people, no matter what you think about me. I think everyone’s amazing. I know about the potential of people, the human being has infinite wisdom inside you, just believe. The first step is to believe in yourself, because if you don’t believe in yourself then you probably won’t believe in your neighbor’s actions. So congratulations to all those who believe and seek to make religion their spirit and science their flesh. If we seek the truth everything else will be added. Everything is possible for him who believes (Mark 9:23) so let us not give up our dreams ever. Thank you heart to all who bring me messages of affection and support me, you make sense of my life!